Our bilingual preschool, pre-K and daycare programs are something special in Brookline. Extra activities, such as weekly music and yoga, cooking classes, science activities, field trips are provided regularly. 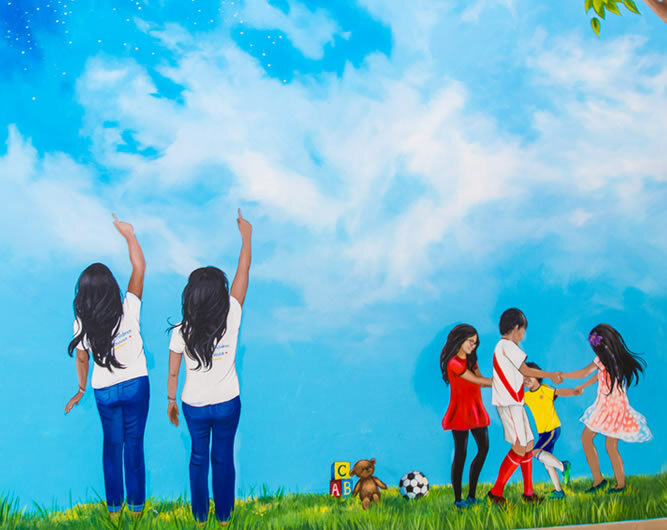 Even our facilities were designed to provide the best child education experience. We provide spacious classrooms designed with our student’s comfort and educational needs in mind. Each class features the latest equipment. We are thrilled to offer our students year-round access to our own sand room and gym. Both are favorites of the children throughout the year, but this is especially true during inclement weather. No matter the conditions outside, students always have access to fun gross-motor play. Our programs for childcare, preschool and pre-K in Brookline are tailored to the needs of each child. We support the needs of breastfeeding infants, for instance. Should a student need one-on-one therapy, we provide special scheduling within the school facilities to meet their needs. Our gym provides private time and can accommodate any special equipment that may be required. Little Children Schoolhouse offers year-round, half and full-day bilingual programs for young infants , older infants, young toddlers, older toddlers, preschool I, preschool II and pre-K children. All programs run from 7:00 am to 6:00 pm. So that we can ensure staff is on hand to provide care, parents are asked to drop off students no earlier than 7:00 am and to pick up students prior to the school’s closing at 6:00 pm. Exact schedules are not made publically available for security reasons, but programs include Circle Time, playground time (weather permitting), weekly Yoga classes, music, reading, special projects, and, of course, time for eating, napping and changing those diapers! Music: Music classes with Jen S. are included in every program. Jen is an extraordinary teacher who creates weekly developmentally appropriate classes. Yoga: Our Brookline preschool and pre-K students enjoy weekly yoga classes at the yoga studio at Brookline Village..
Field Trips and Special Events: Shows, puppet shows, field trips relevant to the curriculum are included in our program. Rhythm Kids: Movement and drumming only for preschool and Pre-K classes. The program helps children to integrate and assimilate rhythm into their lives. Our child-centered environment promotes growth in all areas : social, emotional, cognitive and physical. By using a developmentally-appropriate curriculum, each child is positioned to succeed and develop self-esteem. We encourage self-help skills and support our children’s natural curiosity to explore and experiment. Our program fosters respect and teaches our students to appreciate the cultural diversity in our center. We will celebrate customs and rituals that link our diverse cultures together with other families.